Dr. Margolis is Intern, Department of Obstetrics and Gynecology, Columbia University Medical Center, New York, New York. Ms. Kearney is a third-year medical student at Columbia University College of Physicians and Surgeons. Ms. Schechter is a third-year medical student at Columbia University College of Physicians and Surgeons. Dr. Kim is Assistant Professor, Department of Obstetrics & Gynecology at Columbia University Medical Center. Dr. Advincula is the Levine Family Professor of Women’s Health and Vice-Chair, Department of Obstetrics & Gynecology and Chief of Gynecology, Sloane Hospital for Women at Columbia University Medical Center. He serves on the OBG Management Board of Editors. Dr. Advincula reports being a consultant to Blue Endo, CooperSurgical, Intuitive Surgical, SurgiQuest, Titan Medical and receiving royalties from CooperSurgical. The other authors report no financial relationships relevant to this article. Today’s intrauterine devices (IUDs) represent an excellent form of long-acting reversible contraception. Depending on the type of IUD, many also are used to help alleviate such gynecologic symptoms as abnormal uterine bleeding. Approximately 10% of IUD insertions are complicated by malpositioning, which can include embedding, translocation, or perforation. Malpositioned IUDs are often amenable to office removal but, occasionally, hysteroscopy or laparoscopy is necessary. 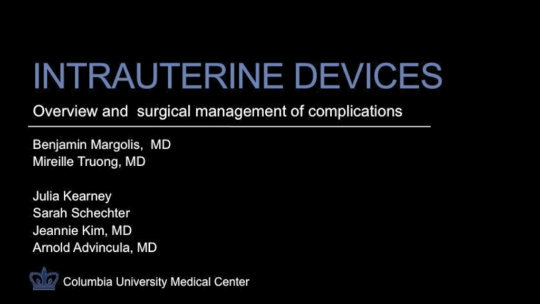 In this video, we begin by reviewing techniques for complicated office IUD removal. Then we present 4 cases of malpositioned IUDs that required surgical intervention; hysteroscopic, laparoscopic, or combined techniques were used in each case. This video highlights how preoperative imaging often is not sufficient to determine the necessary surgical approach. Therefore, patients should be counseled on the potential need for hysteroscopy or laparoscopy to surgically remove a malpositioned IUD. Although risk factors for malpositioned IUDs are not well studied in the literature, understanding proper placement and identification of complications at the time of IUD placement are essential to malpositioning prevention. My colleagues and I hope you enjoy this video.